11 J None No Power Seat 11 J has some extra legroom due to the bulkhead. The proximity of the galley and lavatories may be bothersome. Passengers traveling with infants are often seated in this row. The tray table is in the armrest, making the armrest immovable and slightly reducing seat width. There is no floor storage for this seat during take-off and landing. 11 K None No Power Seat 11 K has some extra legroom due to the bulkhead. The proximity of the galley and lavatories may be bothersome. Passengers traveling with infants are often seated in this row. The tray table is in the armrest, making the armrest immovable and slightly reducing seat width. There is no floor storage for this seat during take-off and landing. 12 A None No Power Seat 12 A has some extra legroom due to the bulkhead. The proximity of the galley and lavatories may be bothersome. Passengers traveling with infants are often seated in this row. The tray table is in the armrest, making the armrest immovable and slightly reducing seat width. There is no floor storage for this seat during take-off and landing. 12 B None No Power Seat 12 B has some extra legroom due to the bulkhead. The proximity of the galley and lavatories may be bothersome. Passengers traveling with infants are often seated in this row. The tray table is in the armrest, making the armrest immovable and slightly reducing seat width. There is no floor storage for this seat during take-off and landing. 12 D None No Power Seat 12 D has some extra legroom due to the bulkhead. The proximity of the galley and lavatories may be bothersome. Passengers traveling with infants are often seated in this row. There is no overhead bin at this seat. The tray table is in the armrest, making the armrest immovable and slightly reducing seat width. There is no floor storage for this seat during take-off and landing. 12 E None No Power Seat 12 E has some extra legroom due to the bulkhead. The proximity of the galley and lavatories may be bothersome. Passengers traveling with infants are often seated in this row. There is no overhead bin at this seat. The tray table is in the armrest, making the armrest immovable and slightly reducing seat width. There is no floor storage for this seat during take-off and landing. 12 F None No Power Seat 12 F has some extra legroom due to the bulkhead. The proximity of the galley and lavatories may be bothersome. Passengers traveling with infants are often seated in this row. There is no overhead bin at this seat. The tray table is in the armrest, making the armrest immovable and slightly reducing seat width. There is no floor storage for this seat during take-off and landing. 12 G None No Power Seat 12 G has some extra legroom due to the bulkhead. The proximity of the galley and lavatories may be bothersome. Passengers traveling with infants are often seated in this row. There is no overhead bin at this seat. The tray table is in the armrest, making the armrest immovable and slightly reducing seat width. There is no floor storage for this seat during take-off and landing. 13 B None No Power Seat 13 B is a standard World Traveller Plus seat with a movable armrest. 13 D None No Power Seat 13 D is a standard World Traveller Plus seat with a movable armrest. 13 G None No Power Seat 13 G is a standard World Traveller Plus seat with a movable armrest. 13 J None No Power Seat 13 J is a standard World Traveller Plus seat with a movable armrest. 14 B None No Power Seat 14 B is a standard World Traveller Plus seat with a movable armrest. 14 D None No Power Seat 14 D is a standard World Traveller Plus seat with a movable armrest. 14 G None No Power Seat 14 G is a standard World Traveller Plus seat with a movable armrest. 14 J None No Power Seat 14 J is a standard World Traveller Plus seat with a movable armrest. 15 A None No Power Seat 15 A is a standard World Traveller Plus seat, although proximity to the galley and lavatory may be bothersome. 15 B None No Power Seat 15 B is a World Traveller Plus seat, although proximity to the galley may be bothersome. This seat has a movable armrest. 15 D None No Power Seat 15 D is a World Traveller Plus seat, although proximity to the galley may be bothersome. This seat has a movable armrest. 15 E None No Power Seat 15 E is a standard World Traveller Plus seat, although proximity to the galley and lavatory may be bothersome. 15 F None No Power Seat 15 F is a standard World Traveller Plus seat, although proximity to the galley may be bothersome. 15 G None No Power Seat 15 G is a World Traveller Plus seat, although proximity to the galley may be bothersome. This seat has a movable armrest. 15 J None No Power Seat 15 J is a standard World Traveller Plus seat with a movable armrest. 16 J None No Power Seat 16 J is a standard World Traveller Plus seat, although proximity to the galley may be bothersome. The tray table is in the armrest, making the armrest immovable and slightly reducing seat width. 16 K None No Power Seat 16 K is a standard World Traveller Plus seat, although proximity to the galley may be bothersome. The tray table is in the armrest, making the armrest immovable and slightly reducing seat width. 17 A None No Power Seat 17 A is a standard rear-facing Club World seat. 17 B None No Power Seat 17 B is standard forward-facing Club World seat, however proximity to the lavatory may be bothersome. It has been reported that if the lavatory door not fully closed it can occasionally swing out and hit the seat when it is in its lie-flat position. 17 D None No Power Seat 17 D is standard forward-facing Club World seat, however proximity to the lavatory may be bothersome. 17 E None No Power Seat 17 E is a standard rear-facing Club World seat. This seat is ideal when traveling with a partner. However, if you're flying solo, you probably want to select another seat as this seat is not very private. 17 F None No Power Seat 17 F is a standard rear-facing Club World seat. This seat is ideal when traveling with a partner. However, if you're flying solo, you probably want to select another seat as this seat is not very private. 17 G None No Power Seat 17 G is standard forward-facing Club World seat, however proximity to the lavatory may be bothersome. 17 J None No Power Seat 17 J is standard forward-facing Club World seat, however proximity to the lavatory may be bothersome. It has been reported that if the lavatory door not fully closed it can occasionally swing out and hit the seat when it is in its lie-flat position. 17 K None No Power Seat 17 K is a standard rear-facing Club World seat. 18 A None No Power Seat 18 A is a standard rear-facing Club World seat. 18 B None No Power Seat 18 B is a standard forward-facing Club World seat. 18 D None No Power Seat 18 D is a standard forward-facing Club World seat. 18 E None No Power Seat 18 E is a standard rear-facing Club World seat. This seat is ideal when traveling with a partner. However, if you're flying solo, you probably want to select another seat as this seat is not very private. 18 F None No Power Seat 18 F is a standard rear-facing Club World seat. This seat is ideal when traveling with a partner. However, if you're flying solo, you probably want to select another seat as this seat is not very private. 18 G None No Power Seat 18 G is a standard forward-facing Club World seat. 18 J None No Power Seat 18 J is a standard forward-facing Club World seat. 18 K None No Power Seat 18 K is a standard rear-facing Club World seat. 19 A None No Power Seat 19 A is a standard rear-facing Club World seat. 19 B None No Power Seat 19 B is a standard forward-facing Club World seat. 19 D None No Power Seat 19 D is a standard forward-facing Club World seat. 19 E None No Power Seat 19 E is a standard rear-facing Club World seat. This seat is ideal when traveling with a partner. However, if you're flying solo, you probably want to select another seat as this seat is not very private. 19 F None No Power Seat 19 F is a standard rear-facing Club World seat. This seat is ideal when traveling with a partner. However, if you're flying solo, you probably want to select another seat as this seat is not very private. 19 G None No Power Seat 19 G is a standard forward-facing Club World seat. 19 J None No Power Seat 19 J is a standard forward-facing Club World seat. 19 K None No Power Seat 19 K is a standard rear-facing Club World seat. 20 A None No Power Seat 20 A is a standard rear-facing Club World seat. 20 B None No Power Seat 20 B is a standard forward-facing Club World seat. 20 D None No Power Seat 20 D is a standard forward-facing Club World seat. 20 E None No Power Seat 20 E is a standard rear-facing Club World seat. This seat may be reserved for passengers traveling with an infant. This seat is ideal when traveling with a partner. However, if you're flying solo, you probably want to select another seat as this seat is not very private. 20 F None No Power Seat 20 F is a standard rear-facing Club World seat. This seat may be reserved for passengers traveling with an infant. This seat is ideal when traveling with a partner. However, if you're flying solo, you probably want to select another seat as this seat is not very private. 20 G None No Power Seat 20 G is a standard forward-facing Club World seat. 20 J None No Power Seat 20 J is a standard forward-facing Club World seat. 20 K None No Power Seat 20 K is a standard rear-facing Club World seat. 28 B None No Power Seat 28 B has some extra legroom due to the exit row. The tray table is in the armrest, making the armrest immovable and slightly reducing seat width. There is no floor storage for this seat during takeoff and landing. The position of the bassinets may be bothersome. It can get very cold by the exits during flight. 28 C None No Power Seat 28 C has some extra legroom due to the exit row. The tray table is in the armrest, making the armrest immovable and slightly reducing seat width. There is no floor storage for this seat during takeoff and landing. The position of the bassinets may be bothersome. It can get very cold by the exits during flight. 28 D None No Power Seat 28 D has some extra legroom due to the exit row. The tray table is in the armrest, making the armrest immovable and slightly reducing seat width. There is no floor storage for this seat during takeoff and landing. The position of the bassinets may be bothersome. It can get very cold by the exits during flight. 28 E None No Power Seat 28 E has some extra legroom due to the exit row. The tray table is in the armrest, making the armrest immovable and slightly reducing seat width. There is no floor storage for this seat during takeoff and landing. The position of the bassinets may be bothersome. It can get very cold by the exits during flight. 28 F None No Power Seat 28 F has some extra legroom due to the exit row. The tray table is in the armrest, making the armrest immovable and slightly reducing seat width. There is no floor storage for this seat during takeoff and landing. The position of the bassinets may be bothersome. It can get very cold by the exits during flight. 28 G None No Power Seat 28 G has some extra legroom due to the exit row. The tray table is in the armrest, making the armrest immovable and slightly reducing seat width. There is no floor storage for this seat during takeoff and landing. The position of the bassinets may be bothersome. It can get very cold by the exits during flight. 28 H None No Power Seat 28 H has some extra legroom due to the exit row. The tray table is in the armrest, making the armrest immovable and slightly reducing seat width. There is no floor storage for this seat during takeoff and landing. The position of the bassinets may be bothersome. It can get very cold by the exits during flight. 28 J None No Power Seat 28 J has some extra legroom due to the exit row. The tray table is in the armrest, making the armrest immovable and slightly reducing seat width. There is no floor storage for this seat during takeoff and landing. The position of the bassinets may be bothersome. It can get very cold by the exits during flight. 29 A None No Power Seat 29 A has plenty of extra legroom due to the missing seat in the row ahead. The tray tables are in the armrests, making the armrest immovable and slightly reducing seat width. There is no floor storage for this seat during takeoff and landing. 29 C None No Power Seat 29 C is a standard World Traveller seat with a movable armrest. 29 D None No Power Seat 29 D is a standard World Traveller seat with a movable armrest. 29 G None No Power Seat 29 G is a standard World Traveller seat with a movable armrest. 29 H None No Power Seat 29 H is a standard World Traveller seat with a movable armrest. 29 K None No Power Seat 29 K has plenty of extra legroom due to the missing seat in the row ahead. The tray tables are in the armrests, making the armrest immovable and slightly reducing seat width. There is no floor storage for this seat during takeoff and landing. 30 C None No Power Seat 30 C is a standard World Traveller seat with a movable armrest. 30 D None No Power Seat 30 D is a standard World Traveller seat with a movable armrest. 30 G None No Power Seat 30 G is a standard World Traveller seat with a movable armrest. 31 C None No Power Seat 31 C is a standard World Traveller seat with a movable armrest. 31 D None No Power Seat 31 D is a standard World Traveller seat with a movable armrest. 31 G None No Power Seat 31 G is a standard World Traveller seat with a movable armrest. 32 C None No Power Seat 32 C is a standard World Traveller seat with a movable armrest. 32 D None No Power Seat 32 D is a standard World Traveller seat with a movable armrest. 32 G None No Power Seat 32 G is a standard World Traveller seat with a movable armrest. 33 C None No Power Seat 33 C is a standard World Traveller seat with a movable armrest. 33 D None No Power Seat 33 D is a standard World Traveller seat with a movable armrest. 33 G None No Power Seat 33 G is a standard World Traveller seat with a movable armrest. 34 C None No Power Seat 34 C is a standard World Traveller seat with a movable armrest. 34 D None No Power Seat 34 D is a standard World Traveller seat with a movable armrest. 34 G None No Power Seat 34 G is a standard World Traveller seat with a movable armrest. 34 H None No Power Seat 34 H is a standard World Traveller seat with a movable armrest. 35 C None No Power Seat 35 C is a standard World Traveller seat with a movable armrest. 35 D None No Power Seat 35 D is a standard World Traveller seat with a movable armrest. 35 G None No Power Seat 35 G is a standard World Traveller seat with a movable armrest. 35 H None No Power Seat 35 H is a standard World Traveller seat with a movable armrest. 36 C None No Power Seat 36 C is a standard World Traveller seat with a movable armrest. 36 D None No Power Seat 36 D is a standard World Traveller seat with a movable armrest. 36 G None No Power Seat 36 G is a standard World Traveller seat with a movable armrest. 36 H None No Power Seat 36 H is a standard World Traveller seat with a movable armrest. 37 A None No Power Seat 37 A may have limited recline and proximity to the lavatory and galley may be bothersome. 37 B None No Power Seat 37 B may have limited recline and proximity to the lavatory and galley may be bothersome. 37 C None No Power Seat 37 C may have limited recline and proximity to the lavatory and galley may be bothersome. 37 D None No Power Seat 37 D may have limited recline and proximity to the lavatory and galley may be bothersome. 37 E None No Power Seat 37 E may have limited recline and proximity to the lavatory and galley may be bothersome. 37 F None No Power Seat 37 F may have limited recline and proximity to the lavatory and galley may be bothersome. 37 G None No Power Seat 37 G may have limited recline and proximity to the lavatory and galley may be bothersome. 37 H None No Power Seat 37 H may have limited recline and proximity to the lavatory and galley may be bothersome. 37 J None No Power Seat 37 J may have limited recline and proximity to the lavatory and galley may be bothersome. 37 K None No Power Seat 37 K may have limited recline and proximity to the lavatory and galley may be bothersome. 39 H None No Power Seat 39 H has less legroom than the bulkhead seats in row 40. The proximity of the galley can be bothersome. The window is misaligned at this row. The tray table is in the armrest, making the armrest immovable and slightly reducing seat with. There is no floor storage for this seat during takeoff and landing. This is a bassinet location, so passengers traveling with infants may be seated in this area. When the bassinets are in use, this seat cannot use the in-seat TV, which lifts up from the front of the armrest. 39 J None No Power Seat 39 J has less legroom than the bulkhead seats in row 40. The proximity of the galley can be bothersome. The window is misaligned at this row. The tray table is in the armrest, making the armrest immovable and slightly reducing seat with. There is no floor storage for this seat during takeoff and landing. This is a bassinet location, so passengers traveling with infants may be seated in this area. When the bassinets are in use, this seat cannot use the in-seat TV, which lifts up from the front of the armrest. 39 K None No Power Seat 39 K has less legroom than the bulkhead seats in row 40. The proximity of the galley can be bothersome. The window is misaligned at this row. The tray table is in the armrest, making the armrest immovable and slightly reducing seat with. There is no floor storage for this seat during takeoff and landing. This is a bassinet location, so passengers traveling with infants may be seated in this area. When the bassinets are in use, this seat cannot use the in-seat TV, which lifts up from the front of the armrest. 4 E None No Power Seat 4 E is a standard First class seat. This seat is ideal when traveling with a companion. 4 F None No Power Seat 4 F is a standard First class seat. This seat is ideal when traveling with a companion. 40 A None No Power Seat 40 A ia a standard World Traveler seat with extra legroom due to the bulkhead. The tray table is in the armrest, making the armrest immovable and slightly reducing seat width. There is no floor storage for this seat during takeoff and landing. This is a bassinet location, so passengers traveling with infants may be seated in this area. Proximity to the galley may be bothersome. 40 B None No Power Seat 40 B ia a standard World Traveler seat with extra legroom due to the bulkhead. The tray table is in the armrest, making the armrest immovable and slightly reducing seat width. There is no floor storage for this seat during takeoff and landing. This is a bassinet location, so passengers traveling with infants may be seated in this area. Proximity to the galley may be bothersome. 40 D None No Power Seat 40 D ia a standard World Traveler seat with extra legroom due to the bulkhead. The tray table is in the armrest, making the armrest immovable and slightly reducing seat width. There is no floor storage for this seat during takeoff and landing. This is a bassinet location, so passengers traveling with infants may be seated in this area. Proximity to the galley may be bothersome. 40 E None No Power Seat 40 E ia a standard World Traveler seat with extra legroom due to the bulkhead. The tray table is in the armrest, making the armrest immovable and slightly reducing seat width. There is no floor storage for this seat during takeoff and landing. This is a bassinet location, so passengers traveling with infants may be seated in this area. Proximity to the galley may be bothersome. 40 F None No Power Seat 40 F ia a standard World Traveler seat with extra legroom due to the bulkhead. The tray table is in the armrest, making the armrest immovable and slightly reducing seat width. There is no floor storage for this seat during takeoff and landing. This is a bassinet location, so passengers traveling with infants may be seated in this area. Proximity to the galley may be bothersome. 40 G None No Power Seat 40 G ia a standard World Traveler seat with extra legroom due to the bulkhead. The tray table is in the armrest, making the armrest immovable and slightly reducing seat width. There is no floor storage for this seat during takeoff and landing. This is a bassinet location, so passengers traveling with infants may be seated in this area. Proximity to the galley may be bothersome. 41 G None No Power Seat 41 G is a standard World Traveller seat with a movable armrest. 42 C None No Power Seat 42 C is a standard World Traveller seat with a movable armrest. 42 G None No Power Seat 42 G is a standard World Traveller seat with a movable armrest. 43 G None No Power Seat 43 G is a standard World Traveller seat with a movable armrest. 44 G None No Power Seat 44 G is a standard World Traveller seat with a movable armrest. 45 G None No Power Seat 45 G is a standard World Traveller seat with a movable armrest. 46 G None No Power Seat 46 G is a standard World Traveller seat with a movable armrest. 47 G None No Power Seat 47 G is a standard World Traveller seat with a movable armrest. 48 C None No Power Seat 48 C is a standard World Traveller seat with a movable armrest. 48 G None No Power Seat 48 G is a standard World Traveller seat with a movable armrest. 48 H None No Power Seat 48 H is a standard World Traveller seat with a movable armrest. 49 C None No Power Seat 49 C is a standard World Traveller seat with a movable armrest. 49 D None No Power Seat 49 D is a standard World Traveller seat with a movable armrest. 49 G None No Power Seat 49 G is a standard World Traveller seat with a movable armrest. 49 H None No Power Seat 49 H is a standard World Traveller seat with a movable armrest. 5 E None No Power Seat 5 E is a standard First class seat. This seat is ideal when traveling with a companion. 5 F None No Power Seat 5 F is a standard First class seat. This seat is ideal when traveling with a companion. 5 K None No Power Seat 5 K is a standard First class seat. 50 A None No Power Seat 50 A is a standard World Traveler seat though the fuselage begins to taper in at this row making the window seat feel especially cramped. 50 C None No Power Seat 50 C is a standard World Traveller seat with a movable armrest. 50 D None No Power Seat 50 D is a standard World Traveller seat with a movable armrest. 50 G None No Power Seat 50 G is a standard World Traveller seat with a movable armrest. 50 H None No Power Seat 50 H is a standard World Traveller seat with a movable armrest. 50 K None No Power Seat 50 K is a standard World Traveler seat though the fuselage begins to taper in at this row making the window seat feel especially cramped. 51 B None No Power Seat 51 B has extra space in the place of the window, but beware this extra space prevents you from leaning against the wall. Because this seat is not quite aligned with the row in front of it, the seat anchors from the row ahead may be bothersome and intrude on foot space. This is one of the only twosomes in the World Traveller section, making it very desirable when traveling with a partner. 51 C None No Power Seat 51 C is a World Traveller seat, but because this seat is not quite aligned with the row in front of it, the seat anchors from the row ahead may be bothersome and intrude on foot space. This is one of the only twosomes in the World Traveller section, making it very desirable when traveling with a partner. 51 D None No Power Seat 51 D is a standard World Traveller seat with a movable armrest. 51 G None No Power Seat 51 G is a standard World Traveller seat with a movable armrest. 51 H None No Power Seat 51 H is a World Traveller seat, but because this seat is not quite aligned with the row in front of it, the seat anchors from the row ahead may be bothersome and intrude on foot space. This is one of the only twosomes in the World Traveller section, making it very desirable when traveling with a partner. 51 J None No Power Seat 51 J has extra space in the place of the window, but beware this extra space prevents you from leaning against the wall. Because this seat is not quite aligned with the row in front of it, the seat anchors from the row ahead may be bothersome and intrude on foot space. This is one of the only twosomes in the World Traveller section, making it very desirable when traveling with a partner. 52 B None No Power Seat 52 B has extra space in the place of the window, but beware this extra space prevents you from leaning against the wall. This is one of the only twosomes in the World Traveller section, making it very desirable when traveling with a partner. 52 C None No Power Seat 52 C is a standard World Traveller seat with a movable armrest. As one of the only twosomes in the World Traveller section, this seat is desirable when traveling with a partner. 52 D None No Power Seat 52 D is a standard World Traveller seat with a movable armrest. 52 G None No Power Seat 52 G is a standard World Traveller seat with a movable armrest. 52 H None No Power Seat 52 H is a standard World Traveller seat with a movable armrest. This is one of the only twosomes in the World Traveller section, making it very desirable when traveling with a partner. 52 J None No Power Seat 52 J has extra space in the place of the window, but beware this extra space prevents you from leaning against the wall. This is one of the only twosomes in the World Traveller section, making it very desirable when traveling with a partner. 53 B None No Power Seat 53 B feels cramped due to the curvature of the fuselage and the proximity of the lavatories can be bothersome. This is one of the only twosomes in the World Traveller section, making it very desirable when traveling with a partner. 53 C None No Power Seat 53 C feels cramped due to the curvature of the fuselage and the proximity of the lavatories can be bothersome. This is one of the only twosomes in the World Traveller section, making it very desirable when traveling with a partner. 53 D None No Power Seat 53 D is a World Traveller seat with a movable armrest. This seat may have limited foot room and under-seat storage space due to the presence of an entertainment equipment box. 53 G None No Power Seat 53 G is a World Traveller seat with a movable armrest. This seat may have limited foot room and under-seat storage space due to the presence of an entertainment equipment box. 53 H None No Power Seat 53 H feels cramped due to the curvature of the fuselage and the proximity of the lavatories can be bothersome. This is one of the only twosomes in the World Traveller section, making it very desirable when traveling with a partner. 53 J None No Power Seat 53 J feels cramped due to the curvature of the fuselage and the proximity of the lavatories can be bothersome. This is one of the only twosomes in the World Traveller section, making it very desirable when traveling with a partner. 54 D None No Power Seat 54 D is a standard World Traveller seat, although proximity to the lavatories may be bothersome. 54 G None No Power Seat 54 G is a standard World Traveller seat, although proximity to the lavatories may be bothersome. 55 D None No Power Seat 55 D is in the last row of this aircraft and may have limited recline. Proximity to the lavatories may be bothersome. 55 E None No Power Seat 55 E is in the last row of this aircraft and may have limited recline. Proximity to the lavatories may be bothersome. 55 F None No Power Seat 55 F is in the last row of this aircraft and may have limited recline. Proximity to the lavatories may be bothersome. 55 G None No Power Seat 55 G is in the last row of this aircraft and may have limited recline. Proximity to the lavatories may be bothersome. 60 B None No Power Seat 60 B is a standard Club World seat, although proximity to the lavatory may be bothersome. 60 J None No Power Seat 60 J is a standard Club World seat, although proximity to the lavatory may be bothersome. 62 A None No Power Seat 62 A has extra legroom due to the exit row. 62 K None No Power Seat 62 K has extra legroom due to the exit row. 63 B None No Power Seat 63 B has extra legroom due to the exit row. 63 J None No Power Seat 63 J has extra legroom due to the exit row. 64 A None No Power Seat 64 A is a standard Club World seat. This seat is one of the quietest and most private seats on the upper deck. 64 B None No Power Seat 64 B is a standard Club World seat. 64 J None No Power Seat 64 J is a standard Club World seat, although proximity to the lavatory, galley, and stairs may be bothersome. 64 K None No Power Seat 64 K is a standard Club World seat, although proximity to the lavatory, galley, and stairs may be bothersome. First, Club World Business, and World Traveller Plus all feature in-seat 110v AC power connections; although, there have been reports that some aircraft have EmPower ports rather than AC power. There are no power ports in the standard World Traveller class. Currently, 31 of British Airways' 747-400s are configured with 52 Club World seats, as shown below. BA plans to outfit their entire fleet of 747s with this layout. Worst flight I've ever had. Flew MIA to LHR on this plane in World Traveller Plus. Seats are the old type with cloth upholstery and very uncomfortable. Entertainment system is something out of the 80's. So small and blurry as it's not HD I was glad when the person in front reclined their seat so I could actually see the screen. Cabin crew also miserable. In world traveller plus they bring drinks round before take off but on this occasion it was water and orange juice. One woman asked why there was no sparkling wine offered to which she got the reply (as the stewardess was walking away), not any left as they only stock enough for the outbound flight. I flew last month twice from the US on different routes and they always served sparkling wine so not sure what his stewardess was talking about. Considering the flight was over $1300 one way I thought the aircraft, service, food and comfort was way below standard. 50A is as good as any seat in economy and better than many. Viewing through the window is comfortable and the seat has the added advantage that with no seat behind, you can recline the seat without inconveniencing anyone behind and there is no danger of some urchin kicking the back of your seat for 8 hours! Seat 29A is great for legroom but as both armrests are fixed, the seat width is limited. For a larger person (I'm 6ft 1in) the tray that extends for the armrest is a little restrictive. Also seat pocket on wall of fuselage was filled with infight magazines, so little space there for personal items. On the plus side you can access the ailse for the space in front of you, as long as the passenger in row 28 hasn't spread out too much. Otherwise a good seat and a good flight on an older aircraft. This seat is terrible. The door hits your leg rest anytime someone opens wide or just lets it go. I sat the LHR to JFK and it happened no less than 10 times. Also many people congregate there waiting for the bathroom. Lastly the seats facing each other is just awkward, especially if you don't know the person. LHR TO AUS = NOOOOO WIFI on this flight !! I sat in 64B which should be yellow because of the foot traffic noise and complete exposure to everyone coming up and down the aisle (no privacy)!! The window seats in Bus Class are the way to go on this journey. I will say the food was excellent and the service superb! This is an old aircraft and needs to be updated drastically given such a long flight. Along with 62K, 64A, and 64K, these four seats are the very best on this 747. Food was good, service was excellent. Plenty of space to move in and out. I was able to get a good four hours of sleep on a 6h.30 flight. The only down side was the poor selection of movies. This review is for the whole flight in general. I have flown this route at least 6 times a year every year for 10 years. I have flown First, Business, Premium and Economy before and I am yet to have an enjoyable flight. The planes are about 10 years too old, and to me they actually feel unsafe. However, they are the only direct flight from Cape Town to London, so I just grin and bear this hellish experience every time, knowing I am going to get there faster than any other route. Plusses: Upper deck has high ratio of bathrooms and attendants (2 each) to passengers (20); lie-flat seats with same height footrests, although narrow, still provide comfortable sleep, especially with the comfortable pillow and blankets. We liked the storage boxes next to my wife's 63K seat. Mixed: Very good service on BA 0190 (July 30), flight attendants friendly and attentive. Perfunctory service and inattentive attendants on BA 0191 Aug. 15. Dislikes: The worst food we've ever had in business class. Main courses limited to two selections, both overcooked and basically inedible. Afternoon snack on Aug. 15 worse than free food on Jet Blue. Dated TVs have very good movies choices, but hard to watch on small, blurry screens. No wi-fi, even in business class. No elevator to upper cabin; be aware if you use carry-ons as we do. Flying in 10augusst 2018 from heathrow to austin. Seats and equipment are getting quite worn. Video screns fading, remotes not very reactive, and entire config is not quite clean. Location is fine. Although near toilet i am nlicked by isle seat and have lots if extra space. The plane was very old to Las Vegas and it smells like that. The seat was very comfortable due to it´s a old plane. The seat is a bit small but it´s ok. I was 1,84cm tall and I can´t lie straight. 13J has a metal box in the footwell that makes extension of your feet very challenging. Rather awkward on a very long flight! On our aircraft the only lavatory for premium economy was on the left side (pilot's side) so I would suggest sitting on the A & B side rather than J & K to make access a bit easier. Flight: LHR - IAD 7/5/2018. Go for the upper deck in business; much more enjoyable. See my review for 63A for general comments about these seats. 64B faces forward and backs onto the stair bulkhead so quiet unless you have get chatty flight attendants (which we had for a while). aisle seats have no direct access to the generously -sized compartments by the windows but there's plenty of room for both A/B seats to store things there. in Aisle B seats you also can directly access overhead compartments. Re flat beds BA provides covers for both main seat and footrest, as well as sheets, a blanket and excellent duvet (although they latter two are a little short for taller folks). In general a very pleasant flight. Upper deck business class seats are much quieter. I really enjoyed the trip. 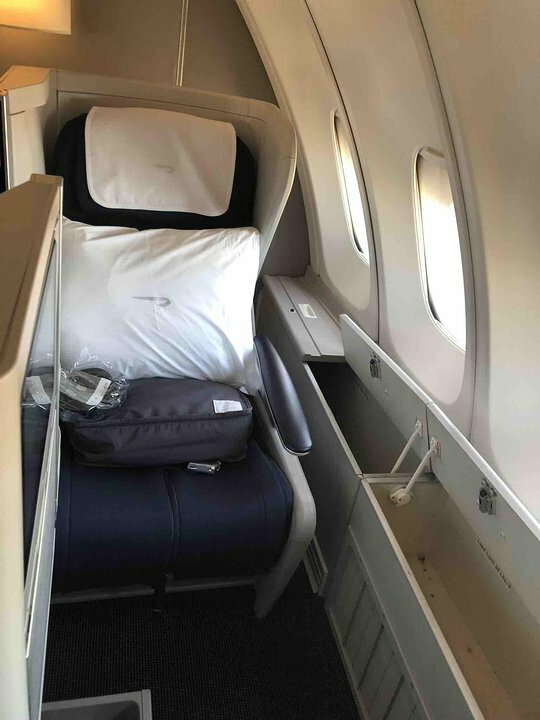 BA has updated the seats so that the beds are comfortable if a little narrow (although if you are tall your head remains a little elevated). This seat, while backward facing, has access to four deep compartments by the windows for storing anything you bring except luggage. Two drawbacks - no UBS port; only one 3 pronged British electrical plug (so plan ahead! ), and to access the aisle when the beds are out you have to step over the customer's legs in 64B. Flight attendants were terrific and very attentive. Dinner was so so; BA is clearly economizing here. Didn't use entertainment so no comment about that. We had a series of lovely flights with British Air. It was our first time flying with them. We got well discounted business seats and sat in the upper deck of the 747. Reserving our seats cost an additional $500 each. It was worth it! The transatlantic flight was excellent both ways. The seats were comfortable, it was quiet and delightful on the upper deck of the 747. They offered a mattress cover for your seat while lying down to sleep and 2 different blankets. The video offerings were excellent, and the airline staff pleasant and professional. On our return trip the dinner offering was absolutely delicious. They are trying to have contemporary food. All in all, we had an outstanding experience and would highly recommend BA in business. The only downside was the older 767 flight from Heathrow to Athens. Even in business the seats were hard and uncomfortable. We were in a A320 form Athens to Heathrow on return and they blocked the middle seat for business. Still quite comfortable and modern and the tea was great! Good grades for BA. The World Traveller Plus seat do NOT have AC power. They have the old EmPower ports but there are no adapters to use them. So it is a long flight with no power. And, the entertainment system is small, blurry, and doesn't respond to touch commands consistently. Overall, these are old planes in bad shape. Flew PHX-LHR in Club World (Business class) seat 18F. This is an aft facing seat in the middle of the cabin. My wife was in 18G (forward facing on the aisle), but we'd have felt closer together if she had been in the adjacent 18E. There's a small privacy divider between E & G, but it does not extend far enough to separate the seat areas. Comfortable seat, but not long enough for my 6 foot 1 inch frame. Entertainment system's screen is blurry, smaller prints are simply unreadable. At take off I got showered with smelly condense water. Mixed review. BA service people are all-around very nice - from check in to the lounge to the plane. However, after meal service I literally didn't see an attendant for about 3 hours or so in the cabin. Kind of weird. Food was solid. Would have been nice to be offered an extra drink for the last 6 hours of the flight -- I would have gladly paid for it. Upsell! Seat was nice with extra legroom. Electronics/screen + audio on a movie was absolutely horrible, easily one of the worst I've ever seen. Plane seemed old and dingy, a bit disappointing. This was one of the worst flights of my life. This aircraft is in horrible condition. The seats are old, the IFE is essentially unwatchable (muddy and over saturated picture). I have the unfortunate pleasure of taking the return flight back to Heathrow in a week, and after that I plan on not flying British Airways in the future. Embarrassing product from BA. I would disagree with the "cramped" description of row 53... it is exactly like in the drawing, still some room to the window. Feels less cramped compared to a B787 to me. I like last row for not bothering anyone behind with my seat reclined, although it felt that it reclines just a little less than the others because of a bulkhead separating it from the exit door behind. Speaking of exit, flight crew declared 53 as an exit row (?!?) so no floor storage during takeoff/landing, not even underneath the seat in front. They even quit my blanket during decent. A reason not to choose 53 again. The seat layout is not great, with the reverse facing seat at the window, but the seats were very comfortable. Great media selection. Food was above average and the flight attendants in the "crows nest", Anthony and Steven, were AWESOME! Would fly this aircraft again. This "face-to-face" seating in business class may be excellent for the couple, but not good for the others. Good seat but for any reason, the chair feet of the front row are not in line with yours. You have to lay your legs from either side of the foot chair in front of you. Less leg room due to multimedia box under the front seat. Great seat, a bit more narrow than others due to in-armrest tray and media screen. The multimedia system is totally outdated on this plane. Excellent window seat. Seemed more private than rows 4 & 5 due to adjacent middle seating. 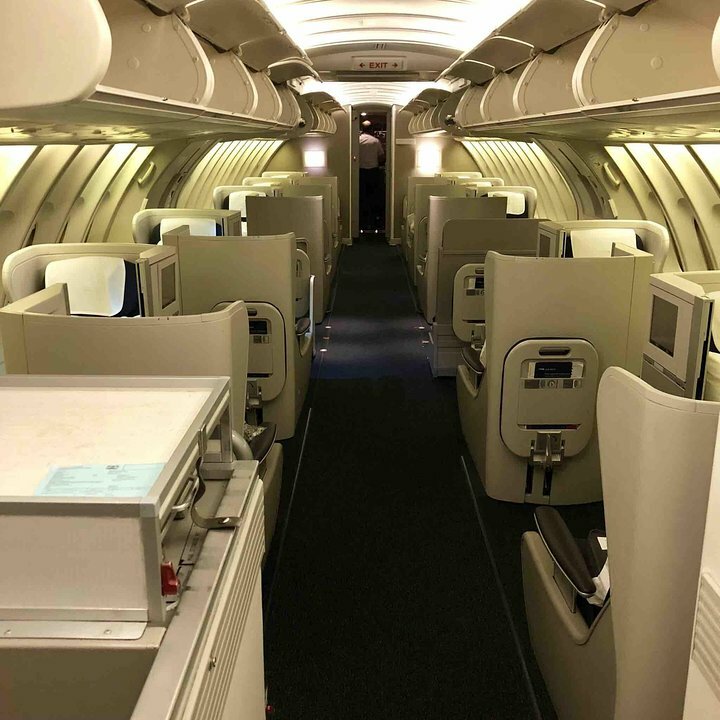 Overall, BA's first cabin is somewhat crowded in comparison to Emirates & Lufthansa. Service & flight attendants---fantastic. BA does not serve caviar like AF & LH. A unit mounted under the seat in front. limited available space for the legs / foots. Not to recommend. This flight from Cape Town to Heathrow did not have on-demand audio or video. I could not believe that a company would fly this type of set up in 2018 and call it a business class seat. Seat 53H has to be one of, if not _the_ worst seat on the plane. My seat was broken, so I didn't even get the 'limited recline' that other reviewers have mentioned. Add to that the fact that for 30 mins after the meal service, multiple people queuing to get rid of that meal thought they could use my shoulder as an ar$e-rest, and that's any chance of sleep gone out the plexiglass window. Even the people milling around in the area by the rear emergency door kept bashing in to the back of my seat. The plane already begins to taper at this point, and the J K seats in row 49 are noticeably less wide than the row in front, . I can confirm that 17B is a poor seat as the toilet door opens towards the rear and bangs into the foot of the seat/bed when fully flat. Not helped by the lady in 17D drinking her own body weight in wine and visiting the toilet often and clumsily. The worst 1st class seats on any BA plane - very little space or anywhere to store personal items, in fact hardly any more room than in Club World. No privacy as half of the 'back wall' missing. Absolutely NOT 1st class and very poor compared to the middle pairs in 1st on A380 and B777. Whole cabin felt cramped and lacking space, 14 seats far too many in such a small area. I would have chosen side seats (A or K) even though this meant that we as a couple would not sit together because these seats have much more space and privacy. Not acceptable BA to sell 4 E&F as 1st class. Club world on the upper deck, is very quiet, and much better than club world on the main deck. All the window seats on the upper deck have extra storage compartments along the side, making these the best seats in club world. BA218 DEN-LHR 4E Comfortable seat but less private than 5E. Foot section felt narrower too. 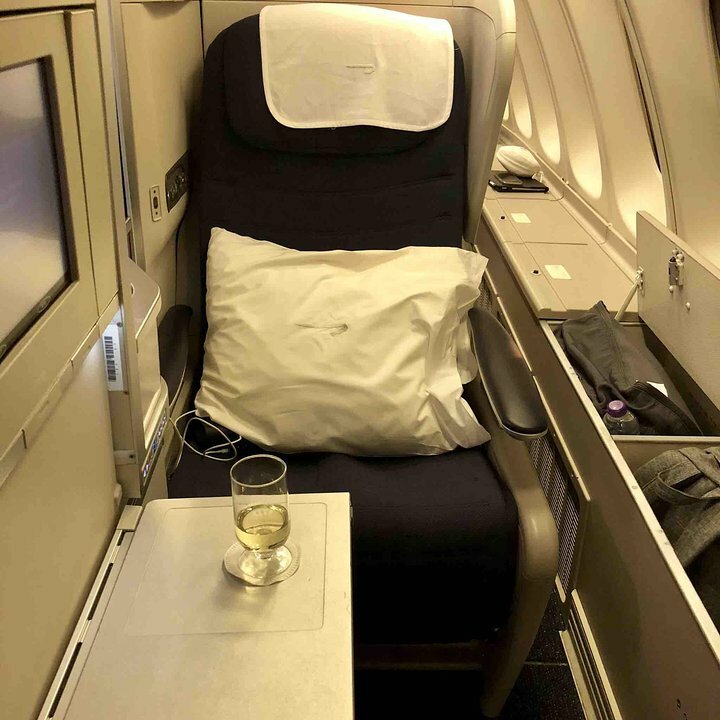 5E BA219 LHR-DEN Very comfortable middle seat ideally suited to a couple (5E/F). Very quiet despite galley behind, and no noisier than 4E on the return flight. Felt like more room than 4E too. Would definitely chose this seat again if travelling as a couple. This is a regular economy seat I had on Oct. 18. For overnight flight it is about as comfortable as can be expected in coach at coach prices. BA has refurbished this plane so the IFE monitor is updated with a good selection of British telly. Flight attendants were busy, but extremely efficient and friendly. Again, for the price, you can't complain. This was an old interior. 15A is nice in that theres no one behind you and there is a substantial gap between your seat and the window. 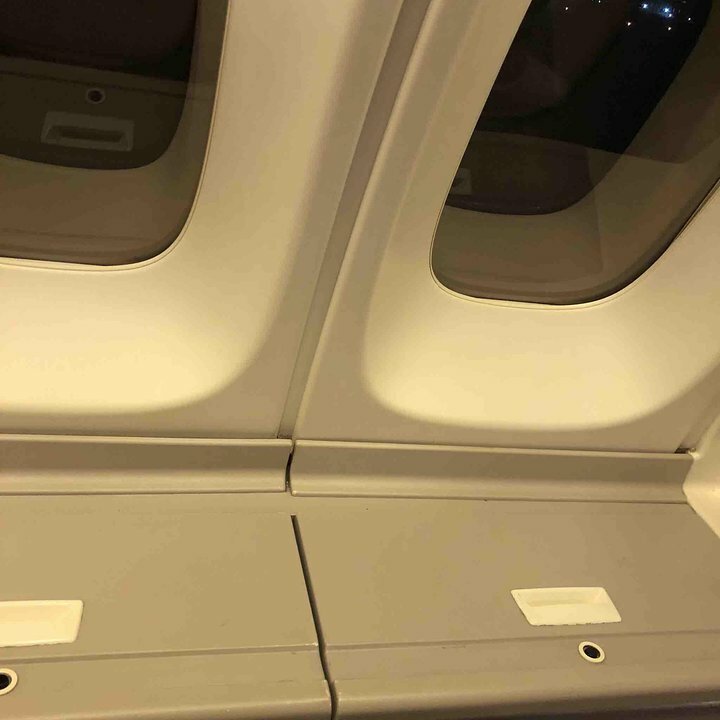 It is possible for an average sized adult male to get out of his seat and to the lavatory without going over the person in 15B thanks to this gap. However, only just barely. And its not the easiest thing youve ever done. One bad thing is you will probably be one of the last people served at meal time since the seat is at the back of the cabin. So if theres a choice of meals and you havent ordered yours ahead of time, youre probably going to get whatever everyone else didnt want. No proximity to a galley or lavatory area which makes the seat a quiet and spacious choice next to the window. However, the configuration does mean you need to climb over someone to leave the seat which can discomfort yourself and the passenger in 20J. Overall a good seat choice for me! Brilliant seat choice. No-one to 'climb' over to get into the aisle, and no proximity to a galley or lavatory area. If you are tall, this is one of the very few seats with good legroom on the plane. Overhead bins are small, crew took my luggage and put in rear closet near steps down to main deck. From SEA to LHR and return on this 747. The upper deck is the best place, and 62A and 62B are the best seats for two people traveling together. No climbing over one another. The forward/rear facing is a bit strange, but the seat padding is the best we've seen on a business class configuration. While this site is not intended to comment on service, I can't resist saying that BA's business class that we experienced was about the same as a low level coach class. Food was marginal at best and the service inattentive. No response to a call button. At least it was comfortable. The upper deck on the 747 absolutely is the best place to be. Every seat is excellent, the aisles are spacious, the seats comfortable and the service top notch. I agree the aisle seats are extremely private, though the aisle seats mean you never have to climb over someone's legs when you want to go to the bathroom. Great seat although not really that comfortable to lie flat in, great locker space at the side and handy shelf. I flew from Heathrow to Dulles and there was something seriously wrong with the temperature control/air conditioning for this seat. Hot air was blowing into it from below/behind and it almost felt like sitting in a sauna. The fresh air that was blowing through the aisles just did not reach this seat at all. Luckily Business class was not full and I could switch to another seat (17 D) which was SO much better, really nice in fact. The nearness to the bathrooms did not bother me at all. Overall, however, the in-flight entertainment selection was a bit on the narrow side on this flight. All seats in world traveller plus have fixed arm rests. This considerably reduces seat width and comfort. The power sockets did not work and the steward advised that this was because it was an "old plane." Having travelled in economy before, the seats there were more comfortable. The window seats on the upper deck are much better than the aisle seats, even though they face rear. You have several storage bins along the window, and the aisle seats do not have this. Also, since the aisle seat has a partition, you are basically in your own private little cabin. Very private and cozy. The seat overall is not great, as it is old and the footrest is a bit flimsy, and it is narrower than a similar seat on the AA 787's. The 747-400's that BA uses are about 20 years old, and the entertainment screens are old too. This is by far the best seat in Business class. I flew LHR to SEA on this flight on July 5, 2017. Yes, you do have to travel backwards but that isn't an issue on these long-haul flights. In this seat you have ample (read abundant) locker space just next to you under the windows that give you plenty of storage plus extra horizontal places to put items while you are eating. You don't have to jump over anyone to get in/out in this seat (BA does have awkward business class arrangements on this plane) and despite the proximity to the galley it is a very private and quiet seat. I felt like I was in my own cabin when the divider was raised. People have complained about the AVOD but mine was definitely up to date with touch screen, good resolution picture, and great sound. The seat was somewhat narrower that I was expecting but when laid flat gave enough room to sleep even with a daytime flight. Food was decent but I'm sure the aisle person was annoyed at the attendants having to reach over him to give me my meals. Overall, A+ seat location. Flew in this World Ttaveller Plus seat from LHR-IAD. Along with all the other WT+ advantages (notably the 38in leg-room) this pair of seats on the left side of the cabin has no wall behind it; the passenger inboard of me in 15A was able to leave his seat without having to clamber over me. A first-rate flight all round; the proximity of the seat to the loos (noted on the map in this forum) was not really a problem. Do not like BA business class seating. Some seats face forward, others backward. No place to set anything other than the tray. Even the arm rests are rounded. A small drawer is down at floor level. Cannot access it without getting out of your seat, but first must move the tray and the tv screen. Power ports are down there too. The bucket seats are a bit deep and pitched back enough making it hard to get out of the seat. The divider between passengers gets lowered with every service to the other person. Lie flat requires lowering and securing a footrest, which the other passenger must step over. No underseat storage for a purse or briefcase, so everything must go up above for takeoff and landing. All in all, a poorly designed business class. The weirdest business class seat design but have privacy due to an up and down screen in between. Seat width is narrow for a 747 business class. Service/food/liquor was great. The entertainment system was awful the oldschool screen kept wagging like a bar door, bad experience. Also why on the earth they put the premium economy in between 1'st and business class on this huge 747? poor design. Business Class Rear facing window seat. A weird seating configuration. The seat next to me was facing me with a screen divider. Terrible design. TV screen tiny picture quality garbage. Poor compared with Emirates or Qatar. Need to raise their game. I recently flew in 51J on both legs between LAS-LHR. The positive is having extra space for your bag on the side + having a 2 seat row with someone your traveling with + being served first. The negative is that your the last to deplane and turbulence is worse in the rear. This row is slightly off centered. This doesn't affect the TV screen and the tray table is slightly off about 2 inches to the left. I wouldn't want to see any further back close to the bathrooms or the standing area where people chat throughout the flight. It was a good flight however on leisure routes these 747's have not been updated so there is old TV system. While I really like the side storage of the upper deck window seats, the ventilation leaves something to be desired. The 60A, being located against the bulkhead can become very stuffy as the 747 has no individual air vents. I was getting up to ask the crew about cabin temperature as I was dripping when I realised that the aisle was cool and fresh. Have another booking in the same seat in a week.. and I am bringing an USB fan! I paid extra for this seat? The whole Club World seating arrangement is poorly executed. Seats arrangement blocks access to the inside two seats and flight attendants cannot reach the inner seats without passing over and/or through the passenger sitting in the outer seat. Seat is too narrow for an average size man to comfortably recline, let alone sleep. I will always avoid using this airplane again. this is a really good seat with easy access out as there is no seat in front, however the comfort etc leaves a lot to be desired, as this plane is really showing its age. This seat has a dedicated exit to the aisle so you're not stepping over the B seat person's legs. Second time flying on BAs First Class offering and swcond time disappointed. For a first class, there are better business class products out there. Service was fine, food average at best, but the real dog was the seat which is not in the same league as its competitors. Sure it has nice lighting effects, but that's all. Save your cash/point and use Business class on BA or other airlines. This seat is frequently reserved as a pilot's rest seat on certain BA flights. It may frequently be empty, or have a person travelling on staff travel, as a guest of the pilots. This is a really good seat. I paid for this seat way before our flight, and I am so pleased I did. We had a 10 hour flight to London from Phoenix (overnight) ahead and I wanted to have enough room to relax a bit. Fair enough, the seat is a tad narrow, but I didn't think it was too bad, especially given the basically unlimited legroom you get. I am 6'1" tall, and of average build. The AVOD on these old 747's is however, really tired and outdated, much like the rest of the plane. Very comfortable seat. The service (food, drinks and atention) was great. The flat bed was so comfortable that after dinner I slept the rest of the flight. These 747s are so dated. The galley computer in business class had a 3.5" disk drive in it. The price if BA business from EU to the US is cheap (at the moment) but you get what you pay for. The TVs are old, the food is sub par, and the ergonomics of the seats are far below the quality of others. This was a good seat.. there is no noise from the toilets and the waiting / standing area for those waiting for them is sufficiently far away there is no inconvenience. It's a standard seat with OK leg room but these planes are now dated. Another advantage I found was the flight had plenty of spaces and the back two centre rows were empty.. I commandeered one and lay flat and slept over the five seats for most of the flight. The arm for the video screen juts about 2-inches into the right side of the seat. If you're a small-medium size person, this probably won't bother you much, but can be uncomfortable for a larger person. Getting in/out of the seat is easy. Wasn't too chilly by the door. I agree that the plane feels old and very dated. My seat was uncomfortable and was bumped constantly by the crew walking by. No foot rest to be found and special to this flight no TV or reading lights!! It was a long, cramped, boring flight. I will never fly Club on an ageing 747 again.The seats and equipment are dated dirty and totally user unfriendly. The remote control for the video screen had to be prised out of its slot by a Flight Attendant,the buttons for controlling the seat position were unresponsive and to cap it all when folk in seats 20D and G have their seats fully reclined you have to hurdle over them to get out. For the money we paid this was a total rip off and the only reason I will fly with BA again is to get rid of my Avios points. After that they can get lost. Flew LHR>JFK on this plane. It was terrible. Seat was uncomfortable from the moment I sat down. Footrest unusable in this row is it's behind your feet. Very narrow for a WT+ seat. I didn't feel as if there was any difference over Economy apart from the extra legroom, which you would also get in economy in the front row. Plane was dirty and old. I'm going to be avoiding all planes like this with BA from now on. Really gutting to pay for a premium product and get rubbish. Last week I flew GVA/LHR/LAS return and I agree with some of the comments that the seats are getting a bit old and tired. 63J upstairs in the bubble doesn't give any extra leg room. 17D isn't that bad with minimal disturbance from lavatory traffic. BA Business class food is reasonable (not great) but then again so are their fares. However, I found the crews to be terrific - best medium, long haul crews I have had in a long time. 64a ... best seat on the plane. Right behind the stairs. Really private. The Club world seats transatlantic both upper and main deck were wonderful. But it was quite a shock then to find my ongong & return Rome BA flight was an A320 with 30-17 really tight seats which are the same size as Ryan air. The only diff from econ is that the middle seat is blocked - otherwise you just paid bzns $ for wretched lowest econ. seats. Having flow biz on AA's 77W, this BA 1st seat was a big let down. Yes, being in 1st was better than in biz (or anywhere else) but with 14 seats, it's cramped and frankly not that quiet (though that's because of passengers). Flew round-trip JFK-LHR-JFK. On the outbound, it was the daytime flight and PJs, pillows, blankets and bed made if you wanted. On the return, only that dirty throw pillow they leave on every seat. Asked for a blanket and got a flimsy one they provide in economy. Service was 5-star and the crew were absolutely amazing, as was the food. Hard to figure out what the process for a la carte dining is. But the hard product was just a disappointment. Plus, it was a remote gate, so we had to be bussed in after waiting on line in the stifling gate area, and then had to wait to board. Nothing exclusive or 1st class about that. You either pay $$$$$ or use lots of miles (as I did) to fly BA 2st when the AA 77W hard product is just as good for a lot less. This plane is extremely OLD and outdated. Video screens are aged and viewing options are very limited. Seats are well worn and even more uncomfortable than usual. The proximity of the galley and infant seating can be bothersome. The window is misaligned at this row. Floor storage is very small. Excellent seat returning from China with my wife. Very private with top class cabin crew. Proximity to the first row with infants/kids was very annoying, along with the engine noise. In business, and I was not able to even watch a movie because the screen was broken. It was a issue reported many times, but the technicians dont care. I know that because we have flown with identical aircraft a week earlier, and the screen still broken. Upper deck is much nicer as you have more storage on the side. But also on the same plane in the upper deck the seat 61J has the same problem with the screen. It wont hold in position, and you cant watch movies. Also the screens resolution is way outdated. But lets be glad we can sleep and sit really comfortably on a 12 hours journey. Nice small cabin, so good service. Great seat overall. Better than downstairs in my opinion. Positives: three windows and a ton of side storage, more than you need. Gives a feeling of lots of space, and very handy for drinks, books, newspapers etc. Laptop drawer too. No issues with flying backwards. Feels private. Food was fine, drinks plentiful. Reasonable selection of films. Negatives: the pull down foot rests are attached to the back of the next row's seat, so you can feel some movement if you have a fidgeting person behind you, and i was aware of the stewards footsteps walking up and down. You do have to step over the other person when they have their footrest down, but I'm only 5' 1" and didnt find it difficult. TV screen could be bigger. The seat layout didnt bother me as the stewards raise the screen for the most part, but i wouldnt want to be in the aisle seat and keep having food n drinks passed right across my lap. This is a World Traveller Plus seat, Wider, plenty of leg room. BEWARE: ILD PLANE!!! = no powerports (unless you have that ancient multi-pin pin adapter), no USB ports, some tv screens work in this cabin, mine needed a tap on the side every now and then to make it work. I see some bad comments here. First of all it is a no brainer to be upstairs at a window. 1. It's quieter 2. You have 2FA for 20 and 2 toilets: ratios not matched downstairs 3. 2x2 not the dreaded 2-4-2 4. Big window boxes for your stuff Aisles upstairs are bad though. First of all the overhead lockers are small and second the floor seems to be made of 2 mm thick aluminium so, being towards the centre, you rock up and down whenever a FA walks past. Being on the edge at a window reduces this oscillation. So, what's best? Again a no brainer. 62AK and 64AK have direct aisle access. 64A in particular is a vast space because of the cot provision. It is never released even to Gold guest list members until check-in. Move like greased lightning. Service is indeed variable. I once waited 2.5 hours for an offer of a drink during an evident 'marital' tiff between two male stewards that was clearly unprofessional. But overall they do their British best. Not Qatar or Cathay or even South African but vastly preferable to US carriers whose FA regard even premium passengers as unspeakable vermin. Have not tried every seat in this cabin but have reasonable sample size. By comparison with other F carriers there are a lot of seats upfront but overall, the 2010 upgrade is a masterpiece of understated design and quality. Service is invariably impeccable, food sometimes a bit patchy and slow. Almost always a good wine available and the trademark Laurent Perrier Grand Siecle will never cause distress. Familiarity breeds contentment. Seats 1A and 1K as noted tend to he held back for Gold and above loyalty members or Pierce Brosnan. Although lovely, the seats are actually really quite close and really well suited in fact to couples. They are narrower at the foot end although do have the advantage of the large wardrobe in the nose. However those seeking seclusion are pragmatically referred to 2AK, 3AK and, especially 5AK (my favorites). For couples 5EF far superior to 4EF for four reasons 1. They are wider at the foot end 2. They have greater seclusion 3. They have more 'walls' around the seat contributing to privacy 4. Those 'walls' enclose greater personal storage This is a no brainer. So the obvious conclusion by exclusion is that you do not want to pay for any type of row 4 seat. Of course they are all preferable to 17E but if you are paying or using points instead of OpUps or do not have a family of four: this is a row to avoid. Least private. 4EF are particularly exposed to oncoming traffic from 123AK. Still must say all seats better than anything in business by far except for 62AK and 64AK. See separate future report. And just impeccable service assured. We flew from JFK to LHR on 747 upstairs. The Atmosphere was relaxing with Good Service. The seat was comfortable and no complaints about the wine or food. Watched a couple of movies while husband slept. Seems like no time at all we were landing in London. Great flight! Seat is narrow, very worn, and not comfortable. Being BA, it is also very dirty. Fantastic seat. Quiet relaxed cabin and great service from the stewards. Only issue was back lavatory was out of order so had to wait a couple of times or go downstairs. If an AAAdvantage member and flying business, strongly recommend booking BA Operated equipment with AA codeshare. 41K seat was horrible, no leg room, horrible service, was waiting for boarding for hours, disorganized, plane is old and outdated, not suitable for a long-haul flight from London to Vancouver. Never BA ever again. I will avoid Heathrow at any cost. BA0295 LHR to ORD Mon 23MAY2016. Seat 63K. The upstairs bubble on a BA 747-436 is a haven of tranquillity. I always prefer to fly facing backwards. The "edge" seats (rows "A" and "K") are blessed with seat-side lockers against the outer hull - in addition to the overhead bins. These are all great seats, with enhanced cabin0crew presence. Seat 63A forces you to climb over the legs on a fully reclined person in 64B. Especially poor when on an overnight flight. This seat configuration is just plain stupid. The next time I fly DEN to LHR, I'll opt for the stop at IAD. T least their seats all face the front of the aircraft. 63 B doesn't have extra leg room. I am 6'4" and I specifically chose this seat because of the comments. In reality there is a hard wall at the end of the foot rest that few of the other seats have. Literally every other seat will allow a tall fellow like me to stretch out fully and this one doesn't. As row 5 is the last row in First Class, seat 5F is at the entrance to the galley. The noise from the galley continued right through the night and made it very difficult to sleep, even with earplugs. Do not pay the extra money to reserve these seats. Both seats have a very limited recline.Passengers in 52H and 52J however have full recline, and when their seats are back these end up 12 inches from your face.This also places a restriction on retrieving anything you may have placed in a bag on the floor under their seat.Due to seat anchors there is also limited foot room.Unacceptable seat for a 10hr 40min flight which you have paid extra for. Excellent seat and good service, best BA flight that I have been on for a long while. I flew Chicago to LHR. The upper deck is very spacious and feels as though you are on a much smaller aircraft than the main deck. New touch screen TVs with a good selection of movies. Excellent food with choice of main dishe including fish and vegetarian. I see that some have taken issue with the facing seats but it really doesn't bother me, nice to have a chat at the beginning of the flight and then you put up the privacy screen. Flew form SAN to LHR. I have been flying business class for work for 30 years, so I have experienced many airlines service. However, It was my first time on a BA flight in over 10 years. I was frankly shocked by the poor service. If you are at all claustrophobic or appreciate having more than one drink served to you, you should avoid these window seats. Looking backwards at your neighbor is bad enough. Once the privacy screen goes up after take off, the flight attendants forget you completely. Its just too much hassle for them to check in with you around the corner, I guess. I feel sad that BA has also followed the decline in service we see in all other US and EU airlines. If you have fly this route, I strongly recommend flying our of LAX or SFO with VA. You will have stop over but the inflight experience will at least be pleasant. Tolerable for the 10 hour daylight segment from LHR to PHX. Legroom was OK and I'm 6' 1". Would be a different story if trying to sleep going eastbound on an overnight flight. Good choice of entertainment however the screens are showing their age and they cannot be adjusted to a good enough angle when the person in front of you needlessly cranks their seat all the way back. LHR to GRU Good seat as there is no one to climb over you but there is almost no storage around the seat, unlike the window seats have plenty of storage.There is little privacy in the aisle seats.TV is awful, about 20 years old. Service with a smile but BA keep almost no food onboard unless you preordered so you may not get anything you like. The snacks are a joke on this night flight.There used to be fresh sandwiches. Now just chocolate and crisps. A shortage of money a stewardess told me so the passengers suffer.They didn't keep enough breakfasts either so I went without again.Most expensive business class London to Brazil and one of the worst I have flown. After a bad BA experience twenty years ago I swore, Never again, and Virgin got my business custom. Sadly last year the Bearded Ones outfit discontinued its LHR  CPT route service, and my wife and I had to resort to BA for our annual winter break (one retirement benefit) in the Western Cape. We were in seats 14 D & E outbound, and 14A & B (with broken foot rest) inbound. Obviously the latter are preferable to the former. These seats were adequate for us trim people; just as well as anyone bigger would have a problem getting out past a reclined seat in front of ones row. BA markets its premium economy seats as World Traveller Plus. Plus for sure right as this year in the absence of any competition BA has hiked its fares for WT+ in its tired old 747s (vs Virgins newer A340s), a small and fuzzy video screen (vs Vs larger and sharper) which system packed up in the WT+ section after thirty minutes outbound, and their outrageous additional charging for pre-booking ones seat (vs Vs free choice). Boarding at CPT was chaotic and, as we saw no reason to Ryanair stampede, we waited for the crowd to thin out. Consequently we and another couple were last to sit in WT+. We might as well have been invisible. After seeing another passenger being served her second glass of sparkling (BA call it champagne) I firmly requested service and we got it. My wife and many annual swallows to the Western Cape are delighted that Thomas Cook Airlines is starting its LGW  CPT service in December using A330s. I can again say, Never again, to BA. Nice seat until the person in front reclines. What a pity as it is so difficult to get out or eat in this situation. The crew were efficient, and the food edible rather than good. If only the seats did not recline! Paid to get the seat I wanted which was 34A and they changed the aircraft, so now I am in 41A. Whats the point in paying extra if you don't get what you want. Travelled LHR-JFK WT+. Half empty so had a spare seat next to me. Good legroom and comfy (if dated) seat. AV not great - small and cloudy screen. Don't take any notice of complaints about pushing AV buttons with your thighs - this is on a long cable and can be easily popped out of the arm. The door from the toilet never bothered me; however, you do get the stray light from the galley shining on you. That is bothersome at times. The funniest thing about this seat: You make eye contact with nearly everyone using the toilet. hahaha.. you have to "will" yourself to look away..
A bit too close to loos and galley for night flights. BA crew professional but these aircraft are now elderly and quite a lot no longer works properly. You feel sorry for the crew as much as for yourself. I was flying from London Heathrow to Sao Paulo Brasil. The overall time of flight was approximately 12 hours and I felt very uncomfortable on my place among two other seats. My height is only 6 ft but I was unable even to turn a page of a book without heating with elbow against my neighbours. The light switchers located on the arms did not match the places exactly, it is enough to say that the switcher of light for the place at the window (K) was located at the place at the aisle (H). There were no personal cold air guns and I had to get accustomed Sao Paulo-like air conditions with my autumn coat designed for the London weather on. The multimedia entertainment was very poor by both its contents (too few new films, Hollywood production only) and technical quality. The overall quality of flight make me to think that nothing has changed on the plane since it was produced some 25 years ago. It made a big contrast to a flight of Lufthansa with the same plane, where the arrangement of places was more suiting modern standards. By some miracle they wider seats and aisles, better conditions for comfort of each passenger. The other flights with BA ever taken by me were also of great quality. The good thing I witnessed on the board of the plane was a great job of pilots, tasty meals and very kind stewards with great sense of humor. Wish you all the best, many good take-offs and same number of peaceful landings. 64A is a fantastic seat for a night flight. Private and quite. Why it is not showing green I do not know. Lots of room for storage. Flew LHR to Ord on the 16th December 2015, crew very helpful, departed about 35 mins late but landed about 10 mins early. My problem was only with the very uncomfortable seat, I am 6'4" and just could not sleep. No problem otherwise. YVR to LHR. Not too shabby, considering that BA's WT seats are made to the same dimensions regardless of plane. Legroom was OK for my 6'3" thin frame, but seat width was rather admirable compared to some airlines that employ 3-4-3 on 77W and 77L craft. However, the 747-400s are getting very old and even BA's impressive fleet of A380s cannot replace them fast enough. The seats are very comfy since they are old cloth and padded well, but the recline doesn't work smoothly anymore and the kind elderly gentleman next to me received a tray table in the chest when the woman in the front accidentally slammed her seat back. Food was OK, and service was cool and professional as usual for BA. Overall not a bad seat, on the trusty old Queen of the Skies but it is a weary plane all the same. Seats 19J,K are not as good for a couple as the two center seats facing backwards, but they're still good. I found it easy to step over foot rest of other passenger to leave window seat when she was sleeping, and I'm 5' 2". Sleeping in the bed position was comfortable. Food was excellent. Lovely cold scallop starter, beautifully plated. 2 nicely cooked scallops served with a sprig of cauliflower on cauliflower purée, topped with caviar and micro greens in the lightest of curry sauces. Cold salmon salad entree had very well cooked salmon served on a bed of black beans, corn, pickled shallots, faro and fresh pomegranate. Can't address the dressing because salad was perfect on its own. Lamb entree also good. There is a large selection of new movies on the entertainment system. Very disappointed with this flight in terms of facilities. The crew were lovely, food was good but 14J has little room under the seat in front. It is and old plane so there are no charging facilities here unless you happen to possess one of the very old adaptors. The video screen is very small and has seen better days. The tray table, which lifts up from the arm rest slopes away from you so be careful anout putting things on it, especially if in turbulence. This was my first international flight and my first time with British Airways. It was also the most miserable 6 hours of my life. I'm only 5'3, snd my knees were almost pressing the back of the seat in front of me. Crossing legs is out of the question. There were a few times I needed to reach my medication under my seat and had to dig through my bag blindly because there was no way of getting my small bag up from between my legs or on the sides. The BA starff was very friendly and the food could have been worse. I'm still in the UK and I'm already dreading the flight back to America. I flew in seat 29J On my way to South Africa from London - possibly the worst seat i have ever had. As the window seat next to you is also an exit seat, the arm rest protrudes an extra 3 inches approximately, creating a cage like experience. When the seat in front reclines, forget about lifting your cup or being able to eat. As for getting anything out of your bag on the floor .... I had to roll it up my leg, as i could not bend forward. I am an average size and height woman, and felt totally trapped. The UK has rules about how animals may be transported, frankly my experience was nothing short of sheer torture and should be illegal. Food and service were poor. On my flight a few days earlier i was seated in the bulk head near the food service area, and had to ask the staff to be quiet during the night, to enable passengers to get a little sleep. Common on BA - get your act together. This is a disgrace. All of the window seats in this 747 Club World config have side bins, which are quite spacious. If like me you travel with no more than a briefcase or small bag in the cabin, there is no need to use overhead storage; all your stuff is right there with you. Buyer beware - nearly every aisle seat on this plane as well as the BA 747's other version has an IFE system underneath the seat in front of it, as well as misaligned seat supports that make it nearly impossible to stow a bag properly. Travelled from LHR-LAS and found the seat comfortable-ish. However if you are a small person and you recline seat, its very stiff and when you put it forward, it yanks you forward which is not only annoying for the person in the set a but also the person behind /next to you! First meal was okay, but second and third (that's right THIRD MEAL)weren't very nice and at the end of flight felt stuffed. Cabin crew were kind and Entertainment was good (even if the screen was a bit small)Overall, I would definitely fly BA again. I moved from 49D to 49C because 49B was empty. 49C feels significantly narrower than 49D - the armrest is positioned over the seat cushion, thus limiting practical use of the space. IFE box underneath seat in front limits legroom. The armrest between 14J/14K is NOT moveable...it's very rigidly fixed and I suspect similar seats on the port side for this configuration are the same. For 14J, the control for the entertainment screen, the headphone jack outlet, and light switch are all located in the housing of the shared armrest. Very good seat and only one of three rows of pairs. Great window view and spacious enough for me, although I am only 5ft6" Does mean you are one of the last off the plane though and at US immigration mean a very long wait. Compared to the competition on this route, this is a tired plane with uncomfortable seating. Difficult to to get in and out of the seats, difficult to manage the controls for both the seat and AV system. Food and drinks were also mediocre. My wife and I recently flew to California (outbound on BA's A380 into LAX) returning to LHR from SFO on the V1 747-400 (744). Both legs in WT+ (Premium Economy). I love the old Queen of the skies and was really looking forward to the flight, in particular as this is the V1 version with WT+ seating forward of Club World. I was to be very disappointed. This is a very, very tired old bird who BA seemingly are not investing in at all. The plastic surrounding the blind was coming away, the footrest (attached to the seat in front) did not go all the way down resulting in an uncomfortable seating position and the rest of the aircraft and area was just tatty. Despite BA insisting that the seat pitch is the same as the A380, it felt far more cramped, and much more like normal WT (Economy). Not helped by the Multimedia box and seat legs in exactly the wrong place to stretch out. I feel if you pay for a service (at near-as-makes-no-difference twice the price of WT) with the word "Premium" in the title you should expect, well a premium product. This falls well short of the mark, so much so that our next trip across the Atlantic will be with BA's biggest rival, Virgin. Having to pay to pre-book a seat in club class is outrageous, having to pass food and drinks to the passenger in the window is very poor as is having to climb over the passenger behind you to get out, really not acceptable for business class. I will not be using BA again! Great seat with lots of room---IFE is now dated but this is still a great aircraft. High Quality service and food come as standard. No traffic in the aisle other than cabin crew and as you are right at the front it is extremely quiet. Screens are small and poor quality image. Controls are in a recessed space in the wall that is not easy to get to unless reclined. At 6'3" this is about 3" more than this seat can accommodate when full reclined. No storage space except a little drawer next to the floor which you cannot access once reclined. Nowhere for kindle, pad, eyeglasses or water. Disappointing for a new C product. Aisle access possible only by stepping over feet of aisle passenger. BA Club World seats have fixed leg room due to configuration, so exit row seats cannot have more legroom. However 62 a/k and 64 a/k are best seats in this cabin. They have a ledge with storage compartments next to the window and there are no persons legs to climb over when leaving the seat while in flight. Because of the specific storage compartment configuration and the high privacy levels 64a and 64k are the best Club World seats on the plane. Having paid $120 to reserve a business class seat on the upper deck, I found it most annoying to be allocated a different seat without prior notice. Worse still BA has failed so far after over 3 months to make a refund, having failed to provide a service I paid for. If they must insist I pay for a seat, they should make a refund when they fail to provide the service paid for. Plenty of leg room but infloght entertainment controls built into seatbarm, bit of a fiddle to access/use. World traveller cabin spacious but food nothing special to talk about. The light 'snack' served at midday was a cereal bar and a very tough cold croissant...not very appetising! I found the "bed" very unconfortable. It does not lie completely flat: the unfolded seat provides 3/4 of the bed length with an adjustable foot rest added to that. The unfolded seat hinge area means that the small of your back has a rigid bar digging into it. The footrest can be set higher or lower than the unfolded seat which makes for uncomfortable legs. There is no accessible storage once the bed is open - so tricky if you need space for spectacles, water etc. you have to climb over a neighbouring bed to get out if you are in the window position. Our plane was formatted with WTplus in the nose area which meant that we had to queue with WT to board. best seat in the world traveller category. wing view. hope to get that seat another time. Seat was short and narrow and the foot rest moved whenever the person in front of me moved. Service on the upper deck was excellent and food was very good. I also think it is outrageous that you should have to pay extra to choose a seat in advance after paying for business class. This is the second trip on British Airways and I will try to avoid them in the future. couldn't cross my legs and I'm only 5'3". The seat in front was not reclined, either. Seat f and I had to share the same carry on space under the seat in front--it was less than the aisle seat's space. Seats not at all comfortable. The flight attendants were good. World Traveler Plus is not worth the price. The only thing that is good is that is ample space overhead. There is more pitch, so knees aren't into the seat in front of you. As you can see the seats are only one inch wider than the regular coach seat. Also no room under the seat in front of you, because the video equipment is mounted there. I know that Club World is much more expensive, but if I travel again from Denver to LHR, I'll look at business on another airline, even if there is a stop involved. 28J is probably the best seat in Economy. After takeoff, they close the curtains to Club World. There's also no bathroom in this area, which means you don't have passengers standing around you. 28J is right beside the exit door, which protrudes outwards a little bit, and I used this door to rest my feet on. Do note that it gets very cold by the exits. I recommend wearing layers, as the one blanket that BA gives you wasn't enough to keep me warm. Flew on this configuration twice in the last month assigned to 20 E or F. Seats were very hot due to airflow restricted by bulkhead. The upper level is the best business class seats on this plane since it is like a private area of the plane. You get specialized service because of the limited seats on this level. All the window seats are the best since they have extra storage on the side. Probably the most uncomfortable seat I have had the displeasure of sitting in. V small which did make me wonder if the free meal and drinks made the additional $400 worthwhile when compared to Transat. I am somewhat bearish in build, with big shoulders and stand 6-1. 60A is a bit harder to get into than I thought it would be, but once in and adjusted, it was fine. I actually caught several hours of sleep, which is rare for me on an airplane. Cabin service was first-rate. I got the new first class seat operated as Club World. 2K is very comfortable, had a footrest which can be used as a small seat for a fellow passenger, the blinds have mood lighting, the seat adjustment knob is really fancy and the seat is a 180 recliner, wide and comfortable. Its an open suite, but has a lot of privacy. This seat was a very good seat. Very private due to the location. The service was extremely good. The top deck is very quiet I fly with BA very often and on the same route (Chicago to London)and when I am on the top deck they always give a box of chocolates to these passengers. to food was very good with a large selection. The seat was very spacious and I had a perfect window view. It is not direct next to the window, giving you some extra space. Seat was comfortable enough for econ class,food was decent too. Entertainment system was terrible,there was a grid on the screen +the speech on the audio was barely audible at full volume.this plane is tired+ in need of an upgrade/replacement. Very cramped seat, not helped by what feels like a bolster on the right of the seat, that digs into your side. Also not helped by an extra big chap squeezing into 48J! Plane was also very tired. 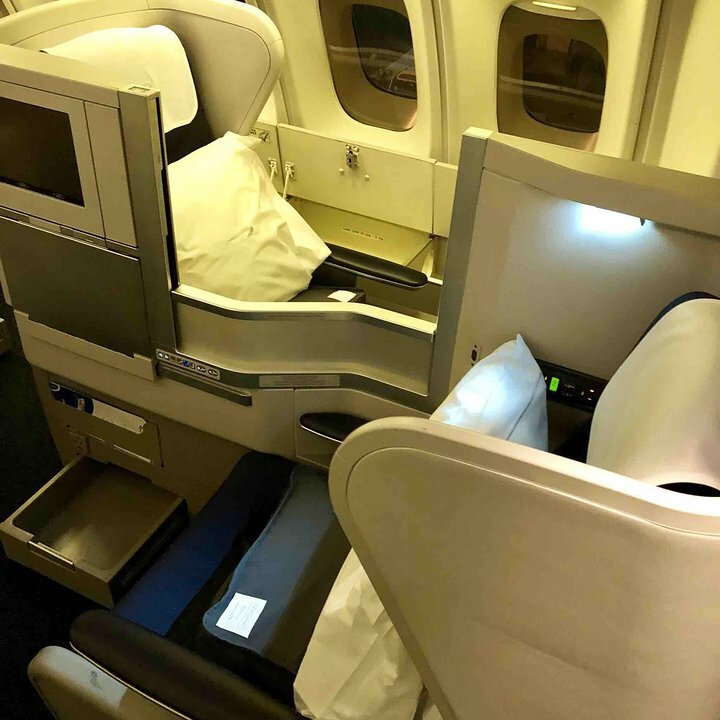 My return flight from CPT to LHR in April was booked as Business Class but BA offer the First Class cabin seats as part of a Business Class service at certain times of the year on this route should all the Business seats be taken. The seat is very comfortable and offers a great degree of privacy and a good overnight's sleep as the nearest seat is on the opposite side of the cabin. This is also a very quiet cabin with only 14 seats and 2 dedicated stewards to provide the service. On aircraft with the Old First cabin, there is a severe lack of power points available and the single point which was available required a special EmPower plug. Also, the TV monitor was very small and not as good as in New First. Overall I would say that, if you are travelling in Business then, unless the aircraft has a New First cabin, I would recommend a seat in Business in the upper deck. I flew on this aircraft from LHR to CPT in March 2015 and found 64A a really great seat. Not only was it very quiet but also very comfortable and was able to sleep well on the 11 hour overnight flight. Also, you can exit the seat without having to climb over the person sitting next to you. The additional storage in the bins next to the window are also a great bonus. The service from the two dedicated stewards for the 20 passengers on the upper deck is first class and the meal selection also very good. The only criticism I have of the older versions of this plane is the lack of modern power points and the need to use an American style adapter rather than a UK 3-pin plug. However, the steward came to my rescue and lent me his own adapter for the duration of the flight. Certainly would select this seat again if flying on this type of aircraft. Lovely seat, vety quiet. you can lay flat and place a laptop by the bulkhead and watch a movie - only thing to be carefull of is banging your head on the overhead rack entering/leaving the seat. Either way it is my preferred location. Rows 49 & 50 seats ABC and HJK all are narrower than standard economy class due to the tapering of the aircraft towards the back. The seats are at least 3 inches narrower and the seat back TV is not directly in front of you as a result. Be aware that all of BA's 747's are old now, IFE is old, seats are old, toilets are old... you get the idea. 29A is a good seat if 29B is empty, otherwise it can feel quite cramped even with the extra leg room due to the missing seat in 28. These are usually high demand seats so the low numbered rows are usually full. BA tend to start their service from the front of the econ cabin though, so good choice on food and drinks. A recent flight back from Accra in 29a was not nice, the screen failed shortly after take off, so I moved to the back of the plane and enjoyed 4 seats to myself in row 53! However, the cabin lights were perm on throughout a night flight which made sleeping, which is hard enough for me on planes, almost impossible. Luckily it's only 6hrs to LHR. Have booked 28B for my next outbound to Accra, I think it's better than 29A. These seats are right by the galley and toilet. Noisy, difficult to get a night's sleep. The extra legroom on this flight is helpful, especially for taller people. The interior, however, is extremely old for this cabin and I think it would be more worthwhile paying the extra $50-$75 for an emergency row seat in WT than to pay a WT+ fare for this particular plane. Food and drink were enjoyable, and staff helpful as always! Flew from London to Las Vegas. This must probably be the oldest plane in the entire BA fleet. Though this is first class the in-flight monitor was only about 2o cm wide,so I rather watched some videos on my iPad, there was no power socket for a laptop (so I could not my work) , the whole cabin was pretty run down and generally speaking so outdated it was a joke. Toilet seat was coming apart, the seat controls did work only intermittently and so on... Crew was apologetic, but for a major airline like BA to have such an outdated interior is really telling. Each and every time with BA it is a disappointing experience...A world apart from the experience of business class of Delta, Swiss, LH, Turkish, Air China, Etihad and others that I had the pleasure to fly. And this was supposedly first class. This aisle seat has hard divider between it and window seat...which is fine only if you are slim else you are squished into position. Seat barely reclines which is great because that means the seat in front of you cant fall into your lap. Red-eye flight had great pillow, clean blanket and smentity kit with an eye mask. Food service was okay. All flight attenants were graciuos and thoughtful. Overall, not sure the room provided in seat 14J was worth the extra cost unless you like wearing a girdle for 10 hours and dont need any space for your feet. this is a great choice of seat for down the back! Well worth paying to lock this seat in. Especially as my flight was 9 hours. I used my hand luggage for a foot stool, covered myself with blankets, and went to sleep. Unaware of the passengers packed in like sardines, behind me! 28B - I flew on this seat from LHR to MEX on an 11-hour daylight flight. This seat is the best seat in the World Traveller cabin, as the armrest on the left side of the seat is moveable, which gives you unrestricted space on that side of the seat. You have more space than the center seats on this cabin, which allows you to place your carry-on bag as a leg support to stretch your legs, if you wish so, to seat with your legs flat, which makes your journey VERY comfortable. You also have unrestricted space and access to the aisle to move around your seat. No passengers mingle around this area as it is located just behind Club World and there are no galleys or lavatories between both cabins. I will book this seat, or 28J on my next flights on World Traveller on board this 747 Mid-J seat configuration. I would avoid this seat for one reason. it is the last seat to get served by the crew, they always start serving at 12A. This meant on the two flights I had in this seat my food choice wasn't available and the coffee was cold or had run out. I did mention this to the cabin crew and they said it was BA policy to serve that way and they couldn't change it.Very Disappointed. 18a & b we found to be suitable for us as a couple, probably better than the central seats. Whoever designed this configuration for club class clearly had cramming in as many seats as possible into a small space, more than the comfort and convenience of club class passengers, as their priority. The seat itself was comfortable enough for sitting but really is just not wide enough from the waist down, when fully flat, to get any decent sleep. I really do not think that I would pay the significant premium to travel BA club again. Great Economy seat the extra space between the seat and window was a perfect place for my bag and the extra space next left from the missing 51A gives extra leg room. Add in only having one person between this seat and the aisle. Seat 1A and 1K are good choices. There is no traffic at this end of first class except at the very start and end of the flight, there is a ton of storage in the closet that you don't have to stretch for and arguably, they have the best view of the plane except maybe for the two blokes upstairs. Seat 64A does have more room in front of the foot rest, but so what. Pretty useless. You have big wing noise in this seat, and it's also the hottest seat upstairs. No air circulation whatsoever in this seat. Very stuffy. I will say this though; there are less people upstairs. Downstairs business is pretty quiet, but more people. Upstairs, the aisle seats don't have the side pockets but there's so much extra storage up there, that there's plenty to go around. The aisle seats have circulating air. 63K and the other row 63 window are the best window seats upstairs, I think, because they are cooler. And not on wing. Horrible food on British Airways, even in business class. Really bad. Virgin Atlantic food is great. Although the right armrest is immovable, the left armrest can be moved out of the way. There is about 15in of space between the left armrest and the wall. Excellent choice of seats as it was dark the whole journey and did not need a window seat and it meant we did not have to climb over anyones legs to go to the rest room, excellent flight frpm Singapore. Whenever we fly Club with BA we always try to sit in 62 J and K.Upper deck on the 747 400 is always a pleasure with 2 Crew to a max of 20 pax, it is like a small private club upstairs.We all know these planes are old and sometimes tatty but the space makes up for this.My wife and I enjoy the old 747 and have flown many miles on this equipment, will be a shame when they all go to 777 and A380.Loads of space in these seats along with good storage, little bit of a pain about the 2 way config. Very decent seat, lots of leg room and room to leave stuff around you after take off. Food was decent and staff pleasant enough. One of the better long haul flights for me. Note on the 20:55 flight from Toronto to London the Club Class food service is woefully poor in this cabin. They expect you to have eaten beforehand in their lounge. The lower deck cabin has to endure Economy passengers filing on in a long line after you have boarded, a slightly uncomfortable position as one sits their champagne in hand. 29K must be one of the best seats in economy. If cost £50 to reserve in advance but gave me (at 6ft 1) more legroom than I need and even though a window seat you can step out forwards to reach the isle. Only minor point is that it is slightly cold in the area due to the proximity to the exit door. Seat 1a (and 1k) are not standard first class seats. They have a smaller monitor than the other first class seats and do not have a private wardrobe. They do have 3 windows instead of 2. Best seat in the house along with 62k as you don't have to climb over anyone to get to the aisle. Great privacy and storage boxes under the window. Even better as a seat than First.